Where Do New York City Bike Commuters Come From? 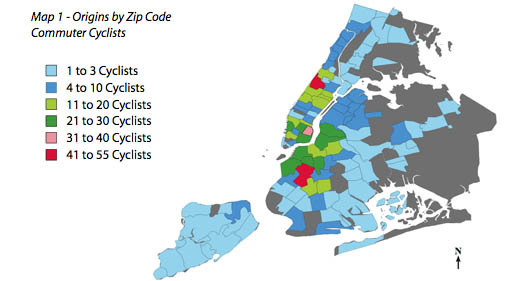 For Bicycle Commuters: 44% start in Manhattan and 41% start in Brooklyn; 81% end in Manhattan and 10% end in Brooklyn. At the work place: 52% park and lock their bikes outdoors, 48% indoors. The average commute time for cyclists is 35 minutes. The most common reason that non-commuting cyclists do not commute by bike is because of driver behavior/traffic and lack of safe storage at work. The most common reason commuter cyclists do commute by bike is because it is healthy/good exercise and because it is environmentally friendly. The report contains some great graphics. The map above shows where bike commuter trips originate, broken down by ZIP code. It turns out that Park Slope 11215 is the neighborhood with the highest rate of bike commuting in the entire city. Manhattan Valley 10025, at the northernmost end of the Hudson River Greenway runs a close second. The neighborhoods of western Brooklyn and Lower Manhattan are up there too. And while we’re at it, check out the massive bike commuting dead zone known as Eastern Queens, in gray above. Not to make everything into a 9th Street issue but I hope this data shows State Senator Eric Adams’ chief of staff, Ingrid P. Lewis-Martin that it would be far more accurate to refer to supporters of DOT’s plan for bike lanes on 9th Street as "constituents" rather than "outside groups" and "special interests," the terms she used in my phone call with her. This is cool. One thing to consider is that zip codes have very different numbers of people living in them. keep in mind that this was an internet survey and therefore probably did not capture the very large immigrant biking community. the 2000 Census or 2005 American Community Survey are currently the best sources of information for biking commutation. Careful how you interpret the low numbers in Queens. I think the immigrant/language issue cited above is important. But also keep in mind that residents in Central and Eastern Queens have longer commute times to work. It takes me an hour to get to work by subway…. even though I used to cycle to work in every other city I lived in, it’s not practical for where I currently live and work. That doesn’t mean cycling isn’t popular in these areas for errands and other non-work trips. Check out page 1 of the report. It is a picture of the Centre Street bike lane, 100% filled with parked cars! Someone has a sense of humor. Despite all the the report’ limitations, including sample size, failure to correct for differences in population by zip code, (and I’m sure there are more) it is very interesting and should lend support to efforts to increase cycling. I especially like the “write-in” comments begining at page 43. I was pleasantly surprised to see that “Oh, yeah, that’s right, you live on Staten Island” isn’t one of the dead gray zones for bike commuting, which I admit is what I expected. Better yet, according to the map, my own close-to-the-ferry sector–including the neighborhoods of Stapleton, Tompkinsville, St. George and New Brighton–is actually pretty well represented. Coming on the heels of the announcement the other day of a proposed pedestrian- and streetlife-friendly courthouse complex in St. George (replacing a huge parking lot on a valuable, strategically located site), this is turning out to have been a pretty good week. These figures represent the number internet survey takers who also ride bikes, not the population as a whole, as has already been pointed out. Yeah, this is not the most scientific survey. It certainly must undercount the immigrant delivery guy cyclist population. I doubt that too many of those fellows are doing online surveys for City Planning. However, the data pretty well corresponds to surveys and studies that have come out in previous years from TA and the City. Noah Budnick has long been saying that the neighborhoods around Downtown Brooklyn have the highest rates of bike commuting in the city. My sense is that, overall, this is probably a pretty accurate snapshot. The relatively low rates for northern Brooklyn and the E. Village compared to Park Slope suggests this is a very self-selecting bunch who responded. Go look at the Williamsburg Bridge path sometime. I stumbled over this page while trying to find an alternative to 2nd Ave., which the city has the nerve to include on the official bike path map. I commute from Queens (Rego Park) to Wall Street. TG, you might be interested in knowing that bike and subway take exactly the same amount of time for me, door-to-door: About 70 minutes. Less if I push, more if I dawdle. Since your bike route goes right past my apartment in Woodside, Keith, I have a suggestion for you. I used to work in Soho, and I took the Greenpoint Avenue Bridge and the Williamsburg Bridge. Thanks! Greenpoint used to be great for getting over to Borden Ave. when I worked in Sunnyside. Maybe I should try that. It saves me a mile and a half from my Queensboro Bridge route, but coming home, it feels like it’s all uphill. It’s better on the outbound portion of the commute, and the long downhills are fun, but I just don’t enjoy riding on Metropolitan and Grand; it seems even less safe than Queens Boulevard, and it’s really ugly. I agree about Metropolitan; it’s one of the most stressful streets I know to bike on, especially in the Newtown Creek industrial area. Myrtle is a bit nicer; you might want to try going south a bit earlier and cutting through some of the side streets in Glendale, or through Ridgewood and Bushwick. So… Myrtle -> Bushwick -> Flushing -> Broadway? That sounds like it’s worth a try. I haven’t been down that way in a while, but I remember Myrtle, Flushing and Broadway as being nicer to ride on than Metropolitan or Queens Boulevard. Let us know how it goes. The name of the survey is ‘Where Do New York City Bike Commuters Come From?’ However, New Jersey isn’t counted. In fact, doesn’t even exist. The ‘study’ either needs to choose a better name or preferably do it’s job so the what is presented has some semblance to reality. Did you look at the study?